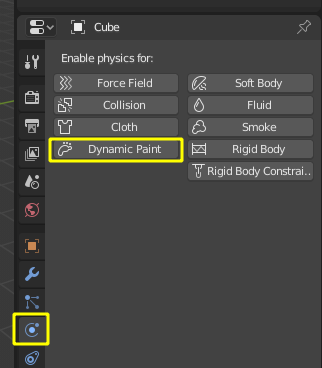 Dynamic Paint can be activated from the „Physics“ tab of the „Properties“ editor. You can also enable brush and canvas simultaneously. In that case same object’s „brush“ does not influence its „canvas“, but can still interact with other objects in the scene.